Growing up right on the Long Island Sound in CT most of my youth, I could get great fantastic New England clam chowder anytime I wanted it. In fact, working in seafood restaurants in high school we were pretty much given free access to the soups since they were always hot, we had giant pots of them and no one would really notice or care. So my friends and I would eat it all the time. The first restaurant I worked in even had 'Rhode Island' or 'Noank' chowder which was basically New England clam chowder without the heavy cream so you could eat it more often and not feel bad about it. I grew to be very fond of it but most people probably wouldn't like it as much the first time around. Regional foods are tough because these dishes are pretty great almost anywhere you go in that region and almost always wrong or not as good for some reason anywhere outside the region. I feel this way about cheesesteaks. If it is called a 'Philly Cheesesteak', it's probably not in Philly and therefore will not be as good. The same is true about New England clam chowder. I haven't found a New England clam chowder that I really enjoyed outside of New England. I lived in the Greenpoint section of Brooklyn for a year in 2007 and my girlfriend and I saw an episode of Throwdown with Bobby Flay where he took on 'The Chowder Surfer'. He was from Brooklyn and was supposedly working at 'The Surf Bar' in the nearby Williamsburg part of Brooklyn. I was blown away watching him make clam chowder and it gave me a hankerin' for some good New England clam chowder. So we went there and tried both the clam chowder and the lobster bisque. The lobster bisque was probably the best I had ever had but the clam chowder really didn't hit the spot. This is when I first decided I needed to learn to make New England clam chowder myself. I've made it now probably half a dozen times and it's evolved and changed almost every time I make it. This batch I was not personally proud of but I know it will be that much better the next time around. I use hard clams for my chowder. These are clams referred to as littlenecks (smaller), cherrystones (medium), or quahogs (large). The bigger the better for chowder. One more note! This is the first time I ever used canned clams and don't think I ever will again! I highly recommend adjusting this to use either more fresh clams or less potatoes and cream. I just had too much soup and not enough clams and wanted to fix it and I regretted it as I could clearly taste the difference between the two types. First you need to scrub the clams under cold water to remove any debris from their shells. Then soak the clams in cold water with a little cornmeal and salt for about 30 minutes or more in the refrigerator. This makes them take in all the water and spit out all the sand and dirt. After they are sufficiently cleaned to can steam them in a large pot with a couple of inches of water. You can cover it at first to get the water hot and then check on them and as soon as they open take them out and set them aside as you don't want your clams to get overdone and rubbery. They should start to smell delicious and as they open they release all the water they have taken in and that is your clam juice or stock and is the key to good clam chowder. You want to set aside the broth for later. 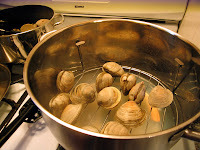 Once the clams cool a little you can remove them from their shells, chop them into little bite size morsels and set them aside as well. Again, the secret to good clam chowder in my humble opinion is the fresh clams and broth. I could clearly taste the canned clams and don't think they will ever be included again. Having worked as a prep chef for two restaurants over the course of almost two years in my youth, I take pride in chopping and preparing my ingredients properly. You'll never find anything that isn't bite sized or tough to eat in my recipes. When I cube my potatoes, I try my best to make them into small perfect cubes, but I HATE peeling potatoes and almost never peel them. The skin adds flavor and nutrients as far as I am concerned. When you are done with them set them aside. You should prepare the leeks by thoroughly cleaning and chopping them. They can get lots of mud and dirt in between their leaves so you may have to chop a bit and then rinse as you see any dirt. Chop your leeks, garlic, shallots, parsley and onions and set them aside. Then comes the bacon or salt pork. If you try to open a package of salt pork and start cutting it you will be very frustrated. My dad taught me to put it in the freezer for a while until its hardened so as to make it easier to chop into very small pieces, roughly the size of the tip of your pinky. Get a nice large pot and add the salt pork or bacon first, cooking until it's crispy and the fat is completely rendered. If you read my split pea soup recipe you will know how difficult it is to pick out all the fat later if you don't make it crispy. You will cook your veggies in the fat from the salt pork and if it's not enough add the butter. You can actually remove the fat later which I will do the next time I make this as there was too much this time around and it is clearly visible in the pictures, floating at the top. Once all your veggies are nice and soft you add your potatoes and clam broth and let them boil and cook until soft, at least an hour or so, more if you can. As the potatoes get nice and soft you can mash them against the side of the pot with a wooden spoon and this will thicken the broth without adding flour. Flour makes the soup almost gelatinous and I don't personally like this approach. 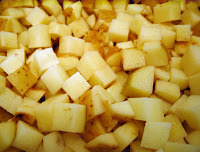 Once your potatoes are nice and soft you can add in the cream and stir until it's nicely mixed. Add the clams last to avoid them getting overdone and remove any bay leaves when serving. Serve while hot with oyster crackers or a nice crusty bread. I will probably revise this recipe and re-post it in the future, but this should give a good idea of how to get started. Great posting! New England Clam Chowder is one of my favorite soups. We are going to have to try out this recipe at some point. In the meantime, I might be inclined to check out The Surf Bar in Williamsburg. Cheers. 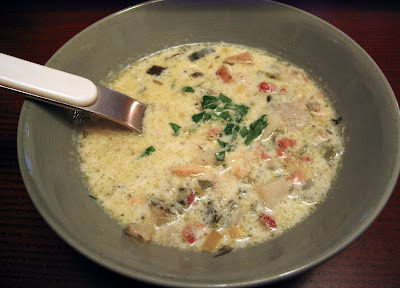 I love clam chowder so much and have never tried it at home... gonna have to give this a shot.. .thanks for posting!